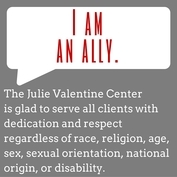 The Julie Valentine Center is governed by a board of directors who serve as the primary fundraising arm of the agency. The membership of this board is comprised of community members who are committed to the success and continuation of Julie Valentine Center and its programs. If you are interested in serving on JVC’s board of directors and you are energetic, eager to learn and willing to actively participate in our awareness and fundraising efforts, contact us at below. Amber Glidewell, Roe Cassidy Coates & Price, P.A.